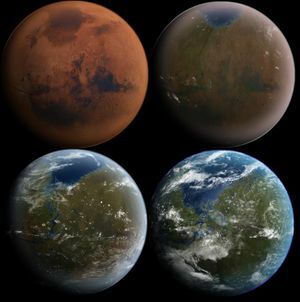 Terraforming Mars is a process by which scientists hope to convert Mars into an Earth-like planet, providing an atmosphere within tolerable limits for human survival. NASA and other science organizations have been discussing a process called terraforming for a very long time. Terraform means to make like Earth. Many proposals have been submitted on the best way to make Mars like Earth. The timelines proposed have varied from 100 years to 100,000 years. Logic dictates finding a balance between moving too fast and too slow. If we terrraform too fast, we may end up with a runaway greenhouse effect similar to what we see on Venus. If we move too slowly, we run the risk of other complications, such as the natural rhythms of the Red Planet changing during the process which could interfere and complicate any progress we may be making. 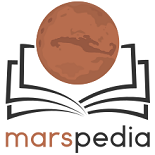 Terraforming Mars is of utmost importance in order to learn to live on other worlds. Humanity must have the ability to be a multi-planet species in order to preserve Homo sapiens for millions or billions of years. See All Featured Articles | Nominate! This page was last edited on 17 November 2017, at 11:49.